Seoul - March 13, 2017 Korea Electric Power Corporation (KEPCO) and GE announced today that they have signed an MOU to establish infrastructure for High Voltage Direct Current (HVDC) in Bitgaram Energy Valley in Naju city. 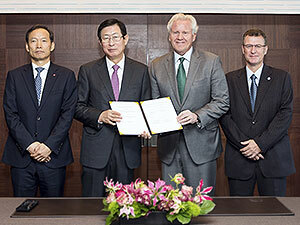 Representatives from KEPCO, Hwan Eik Cho, CEO, Bong Soo Moon EVP & Chief Power Grid Officer, joined the signing ceremony together with Jeff Immelt Chairman & CEO, GE and Chris Khang CEO, GE Korea. The global market for HVDC, now valued at around US$6B, is set to reach approximately US$15B by 2026. Today, both companies have agreed to cooperate on localizing the newer HVDC technology. Bitgaram Energy Valley will be leveraged further as the HVDC test bed with investments in digital grid applications and big data analysis. To support this initiative GE will open an office in Naju by the end of this month. This GE Energy Connections' HVDC technology is the ideal solution for connecting renewables, off shore wind and the smaller footprint makes it suitable for infeed to urban areas. An HVDC system interconnects two Alternative Current (AC) networks by converting AC to DC at one end for transmission and at the other, DC to AC before it goes to homes and factories. As the power demand continues to increase along with the need to integrate more renewables into the energy mix, DC transmission system has proven to be the most economical solution, given that it has lower electrical losses and less radio interference, compared to AC voltage system. Hwan Eik Cho, CEO of KEPCO, said "We are pleased to establish this HVDC infrastructure at Bitgaram Energy Valley through joint investment with GE," adding, "This investment will contribute to the development of Korea's HVDC technology, while the Energy Valley leaps to become a global hub for new energy businesses. 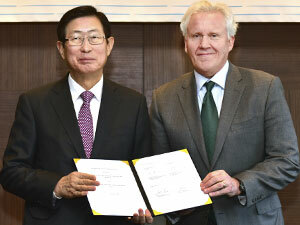 GE's continued investment in Korea will support the growth of local companies in the future." Chris Khang, President & CEO of GE Korea, said "The digitalization of electrical power industry will provide new business models for the introduction of HVDC, renewable energy, and Energy Storage System (ESS) to the market," adding, "GE will continue to seek opportunities to grow with our Korean partners through technological cooperation in the energy and power space." Beginning with this MOU, KEPCO is expecting to attract Korean and global companies in the HVDC industry, create jobs and revitalize the Energy Valley. This will also provide Korea with the opportunity to grow as center of the global HVDC industry.